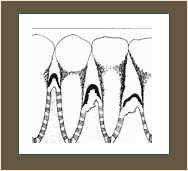 Periodontal disease is an infection of the tissues that support your teeth. Your gum tissue is not attached to the teeth as high as it may seem. There is a very shallow v-shaped crevice called a sulcus between the tooth and gums. Periodontal diseases attack just below the gum line in the sulcus, where they cause the attachment of the tooth and its supporting tissues to break down. As the tissues are damaged, the sulcus develops into a pocket: generally, the more severe the disease, the greater the depth of the pocket.